To prepare for this report, information was gathered about the television programmes broadcast by general-interest Spanish channels with a national scope. This criteria purposely excludes nationwide theme channels (specifically, Canal Historia and National Geographic, among approximately thirty more), general-interest channels with a regional scope (around fifty more) and pay-channels from a wide variety of platforms (with an offer that extents to much more than 200 channels, including those with a regional, a national or particularly an international scope). This report focuses exclusively on programmes broadcast by the six channels that meet the previously mentioned criteria: TVE1, La 2, Antena 3, Cuatro, Tele 5 and La Sexta. The six of them belong to larger media groups. The first two, to the public body RTVE, the Spanish public television; Cuatro and Tele 5 to Mediaset while A3 Media owns Antena 3 and La Sexta. The total audience they attracted in the year 2016 was 55.4%. They constitute what is commonly considered as the official TV programming of the day, both in terms of topics and formats. These basic details confirm the relevant importance that this group of channels has for the majority of Spanish TV viewers and, consequently, how convenient its analysis is to assess the relative importance for the audience of the topics, genre and formats that compose the programme list of these channels. Those topics and types of programmes that are not included in the general programme schedule are as good as nonexistent for the general audience. Theme channels –both open and pay- simply play a subsidiary role, with the acceptable exception of those specialised in children and pre-teens programmes (such as Disney, Clan Television and similar ones). Canal Historia or National Geographic would be included in this secondary section for obvious reasons. From a different perspective, though, every programme that is not included in this general programme list is not relevant, it barely has any impact on the popular mass culture in contemporary Spain. As explained before, these television channels have the largest audience and are available for every family: it is not necessary to pay for them. To this date, they attract the largest majority of viewers (55.4% in 2016) and define the general programming principles: they broadcast all sorts of genre. They establish the most successful formats that may later be transferred to some of the theme channels designed for an specific audience with restricted interests. They usually are the ones to set the general tone of the TV products (for instance, the trend to oversimplify and spectacularize any type of content or format). Unlike theme channels, their programmes focus on what may be considered as general interest, instead of doing so on fragmented audiences with specific interests. Regarding the matter analysed here (history or scattered historical contents on television), its presence or absence will allow to assess the extent to which history is interesting for a general audience (in the views of TV producers and programmers) and, more specifically, which would be the most successful points of view, referential framework and circumstances. This is an essential factor, as history is not only made of topics, but also of the ways theses topics are delivered: both aspects are equally important in television. A positive consideration of history is reflected, for instance, in the inclusion of historical roots in news bulletins, as news bulletins are well considered programmes. A mere scene –with no specific reference to any particular situation- in a low-budget soap opera reflects a total lack of interest in a coherent explanation of the past, even when it may be considered an evidence of the interest of a certain section of the audience for fictional plots developed in the past (despite the lack of an specific historical setting). There is an added value in the choice of the 1st – 7th May week: its connection with the Labour Day as a usually protest-led festivity held all over the world. Supplement to this is the commemorative nature of the date: nothing easier than remarking the historic facts and circumstances of the event (and, for historians and history enthusiasts, it is something simply compulsory and necessary). There are few international celebrations with a clearer focus on its past, both in terms of its inclusion in the day’s programming and the way chosen to include it, as well as the impact it had on the programming. In the Spanish case, there is another relevant historic date that, although nowadays is only a bank holiday in the region of Madrid, it was celebrated, in different and long periods of time in the past, as a national event: the 2nd May, that commemorates the popular uprising of the people of Madrid against Napoleonic troops. It is considered the starting point of the Contemporary Era in Spain, as well as the beginning of a new historical period in which the people is given a greater historical importance in Spain. Consequently, some references to the date and roots were also to be expected. Before anything else, it is necessary to specify the precise definition of ‘historical’ broadcast or television programme for the sake of this report. In general terms, audiovisual fiction productions may take place in the past or the present of the production process. Although the latter may with time constitute –as they do- a historical source –like any other culture product- they are obviously not considered as historical. The reason is that they do not set their narrative focus in the past, which is the first and fundamental requirement to relate them with the concept of history. Considering those audiovisual products whose plot takes places in the past, some of them may deliberately reflect certain historic scenery as a constituting part of the plot, or even have an explanatory nature or narrate the past in wider terms. Those are the products typically considered as ‘historical’ (or with a historical purpose) by historians and viewers with a mid-to-high cultural level. Other products simply take place in the past, but that past is not intended to be explained nor plays a relevant part in the plot, being a mere setting for an independent story. Despite the E-Story team of historians forecasting a certain highlight on the historical facts related to the events commemorated those days (1st and 2nd May), evidences show that they scarcely had any relevance. As the television experts from the Spanish work team expected, the ‘history’ presented those days was no different that in the prior or later weeks. That is: television programming –the scheduling and planning according to the programming principles of each channel- had an essential impact on the type of ‘past’ offered: the same historical contents offered throughout the season, offered in the same way. This allows an initial hypothesis: the history seen in the general-interest free television does not correspond with the interests of historians or history enthusiasts. It hardly has anything to do with an objective assessment of the importance of certain processes in its time or in connection with the present. Neither has it any connection with the interests of politicians, with the probable exception of news bulletins. They responded to the currently dominating programming professional criteria, focused on appealing to the wider audience possible in each time-slot (roughly: mornings, evenings, prime time). In other words: those who decide which history (topics) and in which way (television format) that history will be offered are not historians. They typically lack any training in history, besides a general, basic education and, consequently, they tend to think in history in terms of factual reconstruction (history is made up of ‘objective’ facts) that have an influence in the present (as an interesting background information or as a determinant factor) but that should be given an individual personal approach (to ensure truthfulness and an emotional response: ‘that is what happened to me’). Innovation is a need for the television medium in a moment of crisis and fierce competence embodied by the Internet and the new entertainment offers. This also constitutes a new chance to offer new ways of presenting history. Television schedules leave aside highly interesting experiences connected to transmedia narrative or, to a lesser extent, supplementary programmes to those rather successful products set in the past. In this group is it worth mentioning at least two highly interesting experiences. Firstly, the ‘historical’ series that has taken a step further in transmedia storytelling: El ministerio del tiempo. Secondly, two programmes that were completed with additional historical information -even though they did not reach the same level as the previous example- were two very successful series: Isabel and Carlos. Within this trend of completing the information on the period that offers the chronological setting for the main series, it is important to also highlight Cuéntame cómo pasó, a drama series starting in 2001 which has had very high audience rates over the years and has survived to the change of ruling political parties in the government (and the consequent change in the management of TVE, the national public channel that broadcasts it): Partido Popular, Partido Socialista and Partido Popular again. The series tells the ups and downs of a mid-class Spanish family from the last days of Francoism to the 80’s (in the current series). Following this series another programme is broadcast: Ochéntame (the title plays with the words of the original title Cuéntame –that means, “tell me”- and “ochenta” –the eighties- so the resulting term may be translated into “tell me about the 80’s”), a nearly 60-minute documentary series that alternates real footage from the 80’s with witnesses and key figures of the time explaining their experiences. It somehow contextualizes fiction via a documentary. Although the majority of viewers switch off their TV sets when the fiction series finishes (partly due to the late hour in which Ochéntame is programmed), the fact that it remains in the schedules is an evidence both of a television approach focused on the general interest and an innovative one that tries to use the appeal of historical fiction to make classical historical formats, easier to link to academic purposes, more attractive. In brief: some innovative experiences in television have been used to offer a larger number of more modern products based on historical facts (exclusively in public channels). This innovative experience, however, have not become the norm in the other channels. The higher production costs is one of the reasons, as it is the fact that audience rates have not reached the expected levels. History in the general-interest free television broadcast in Spain (1st to 7th May 2017). Programme offer divided into time slots. When studying Image 1 it is important to consider that history-related programmes (or, to a lesser extent, set in the past) were not overlapped during the analysed week. A viewer interested in watching every free historical programme broadcast by the general-interest Spanish channels on the first week of May could have easily done it with the only help of a remote control and a TV set. A total number of 29 hours of history or past-related topics were broadcast throughout the week, excluding two full-length fiction films that may fit in that category. A second consideration is that they constitute long hours of historical content for a programme schedule oriented to general interest and out of the late-night slot (that starts at 00:00 a.m. in Spain). This evidences that history or past-related topics do not lack as much popularity as it is frequently believed. They are also available for all sorts of audience. There are historical programmes or programmes set in the past in every time slot and it is possible to follow several of them because they are not overlapped. There is a wide offer in terms of timing and, consequently, available to all types of audience and formats. In the morning, history is present in the leading format of the slot: news bulletins. But this information alone may be deceptive: history here is only used as an information source in connection with the events commemorated and only in two of the six analysed channels: the 1st and 2nd of May are mentioned in Tele 5 (1st – 2nd May) and the liberation of Mauthausen camp in La Sexta (6th May). A superficial comparison between Le Pen and king Louis XIV in relation with the French presidential campaign was made in a current-affairs morning programme in La Sexta (Al rojo vivo). Finally, in the same channel, three references more were made over two days (2nd and 5th May) in the context of an advertorial-like report (Hoteles con encanto) when explaining the past life of certain buildings and their historical context. La 2, as we will analyse later on, maintains a regular programming of documentaries and offered a historical one in that time slot (the 50-minute Hitler’s People). This decision is nonetheless more based on the specific principles of the channel (it is a culture-oriented public channel) rather than on the general trend. The evening slot (that extends from the lunch-time news bulletin -3:00p.m.- to the evening news bulleting -9:00 p.m.-) is the one that contains the greater percentage of past-related contents. Historical references are made again in the news bulletins (Tele 5 and TVE1) with identical purpose to the ones in the morning. But the main characteristic of this slot is the link between past and entertainment in Antena 3’s soap operas. Amar es para siempre and El secreto de Puenteviejo take the viewers respectively to the francoist years and to a diffuse period in the early 20th They fill a 2-hour slot from Monday to Friday (in this case, the 1st of May is excluded as holidays typically have a special programme schedule). They share the use of a historical setting for twisted plots full of star-crossed lovers, intrigue, natural children, modern day worries taken to past times, acts of madness, jealousy, crime investigation, etc. To summarise, they chain one plot after the other around the same group of protagonists plus the necessary additions for each season, so to engage the target audience of that slot (home-staying men and women: housewives, retired and unemployed people, etc.) to the same characters time after time. Amar es para siempre is, in fact, a sequel of another soap opera (Amar en tiempos revueltos) with the same main characters that started in 2005 on TVE1 and that has continued under a new title on Antena 3 since 2013. In both cases, history is a mere setting. This peculiarity is clearer in the case of El secreto de Puenteviejo, in which no reference is made to the political or cultural context that may allow an accurate chronological location. It is a ‘costumbristish’ type of past, one that evokes the classical Spanish operetta genre: zarzuela. For the newcomer, it is enough to understand that the action takes place in the first third of the 20th century (or even before that). It is, in a nutshell, a zarzuela-like past deeply embedded in an entertainment-ridden format structure. History is omitted when considering the lack of historical explanation to that allegedly historical setting. The stories of the different protagonists are not solved in a logical way according to the supposedly historical context. For instance, the town mayor or the local priest should have a greater influence on the village of Puenteviejo, but this theoretical prominence is frequently ignored to allow a specific ending for a story arc. They are not a priest or a mayor as they should be, in terms of historical coherence, for the narrative sake: the first is, above all, the stereotypical ‘honest man’, while the second is a ‘henpecked’ husband totally dominated by his wife. In brief: even though this soap opera is set in the past, history is omitted there as there is not the slightest explanatory intention. A different case is that of Amar es para siempre. Firstly, because it is the sequel of another soap opera that did have a historical approach (Revuelta, 2016). This initial factor has faded in the sequel but has not entirely disappeared. For instance, the viewer knows exactly the year when the plot takes place and the main historical events are reflected in the fiction. The relevance of history has decreased and some of the plots include characters that are not so typical of that time, the 1960’s, despite the fact that some of them are based on real events. The main intention, nonetheless, is developing typical plots from soap operas rather than spreading historical knowledge through fiction. La 2 continues broadcasting historical documentary films and series in this time slot, in coherence with the channel’s principles. That week they offered two documentaries per day and, in some cases, even three (1st May). The early night slot (from the 9 p.m. bulletin to midnight) is the one that offers a wider variety in terms of programmes, and it is also considered prime time and, consequently, it is the time of the day when the fiercest competence for audiences takes place. Channels, therefore, choose carefully their contents and formats. When a historical approach is included here, it is because the decision was taken after a time of reflection and with the confidence (or, at least, the hope) of gaining the highest audience rates, if not a minimum of a good ranking position. For instance, when a highly-expected international football match with a foreseeable audience success is to be broadcast, other channels may decide to approach the type of audience that may not be interested in sports, but in alternative topics. This is a common choice among channels that typically target minority audiences (La 2, Cuatro, La Sexta). It is worth noticing, consequently, which channels and when make use of historical contents in prime time. Firstly, history takes part in news programmes (not new bulletins exclusively) in the same way it did in previously analysed time slots: as background documentation for some specific pieces of news. When that is the case, each channel makes a different use of it and, in general terms, history is typically linked to the best considered programmes of the slot (news programmes in this case). For instance, La Sexta included ‘historical facts capsules’ within El Intermedio (1st May) and Salvados (7th May). They are news programmes with a great relevance in the programme schedule of the channel: the first is a news programme with a humorous approach, and the latter a report programme with deeper contents delivered in longer pieces. The general principle, nonetheless, is maintained, and there is no room for deception: history barely had second-long appearance in the first case and minute-long in the latter. Its function is serving as a mere intellectual façade: a self-justified comical anecdote (comedy in history) or the starting point of a conflictive situation such as the one of a minority progressively disappearing due to a case of abuse (the marshlands in Doñana). In the remaining channels there is nothing historical but some mentions to the events commemorated those days: the previously mentioned 2nd of May in Tele 5 (2nd May), the day of the Cross in TVE1 (3rd May) and the end of the reconstruction of the tomb of Emperor Augustus (Cuatro). Among the format options addressed to minorities with the largest number of potential viewers, there are two, from Cuatro, that are worth mentioning: Cuarto Milenio and Planeta Calleja. The first (starting in November 2005) deals with paranormal phenomena and has been broadcast for long years (first on the radio and, then, on television). Its audience has being steadily growing –for example, to a peak of 9.2% on 4th September 2016-, even though it does not reach the most important share rates (17.6% in TVE1 and 15% Antena 3, the same day at the same time). The historical topics on 6th May were the tombs found in a 16th century British abbey, the sinking of the Titanic and the reconstruction of Palladius’s face. This should not lead to deception: in total, only 6 minutes were used on these topics in a several hour-long programme. History is used to fill blank spaces. The majority of historians would not be, nonetheless, very bothered by the fact that this happens in that programme in particular. Planeta Calleja, on the other hand, is a travel and adventure programme (controlled adventure, should be added). It has a similar function to the previous example, on Sundays as well: its audience peak is a 10.4% (28th May 2017). On 7th May it got a 9% when it included information on the Basque culture and its connection with Georgia and the Orthodox convents in that country. The main interest of the programme was not that story, though. It was a celebrity (the singer Antonio Orozco) taking part in an adventure trip and the historical content did not exceed a total of 6 minutes. The programme with a closer approach to academic history in that slot (excluding documentary films in La 2) was one in TVE1: the Cuéntame cómo pasó series and the following documentary spin off Ochéntame otra vez. Although they are very different products (the first, a prime-time fiction series; the second, a late-night documentary series), both approach the 1980’s. The very successful fiction series has been broadcast for long years. It has nearly become the official nostalgia TV chronicle of the time between 1968 and the 80’s. It is similar to other products like the Italian miniseries La Meglio Gioventú (Marco Tulio Giordana, 2003) but has a long-term audience success that has extended for even more years. Cuéntame has thus become a living memory of the experiences, personal or not, lived through the Spanish transition to democracy and its aftermath, in spite of having all the typical clichés which historians despise in audiovisual fiction products. It can be reckoned that this series and the following documentary (Ochéntame) constituted the most intense and richest in audience variety in Spain, not only in that week but for many years. Meanwhile, La 2 maintained a programme schedule that included historical documentaries: at 12.00 p.m. on 4th-5th May (about the Mayans’ forgotten city and, later on, scriveners in Ancient Egypt) and the programme called La noche temática about Osama Bin Laden (7th May). To summarise: an analysis on time slot evidences some presence of past-related topics adapted to the target audience and the most appropriate format for the moment. The most relevant examples in terms of hours on screen are the Monday to Friday soap operas from Antena 3: they are broadcast two hours a day except for the weekend. The type of past and the way it was reflected is a different matter. The target audience is representative here: mid to low class midwives and unemployed people. The second most relevant time slot is the prime time slot. The key programme would be Cuéntame, with its spin-off, Ochéntame. The first is a weekly fiction series with a high-budget production. It is well established in the audience preferences and maintains high rates of share (15-20%). Classical historical TV documentaries are frequent in La 2 (16 hours only in the analyzed week). Ironically, though, only three of these hours were included in the prime-time slot. In other words: history is used to fill programming gaps in a minority-oriented channel. It is also worth mentioning that the most successful documentary series is the one on TVE1 after the highly successful Cuéntame: Ochéntame benefits from the remnants of the most relevant fiction series of the channel (about 3 million viewers) which is not only historical, but it also enables an easy access to a documentary on the same historical period (simply taken from a different perspective to the one in the fictional series) that engages around 800,000 viewers. All this enables a clearer analysis on the presence of historical images in the Spanish free television programme schedule. 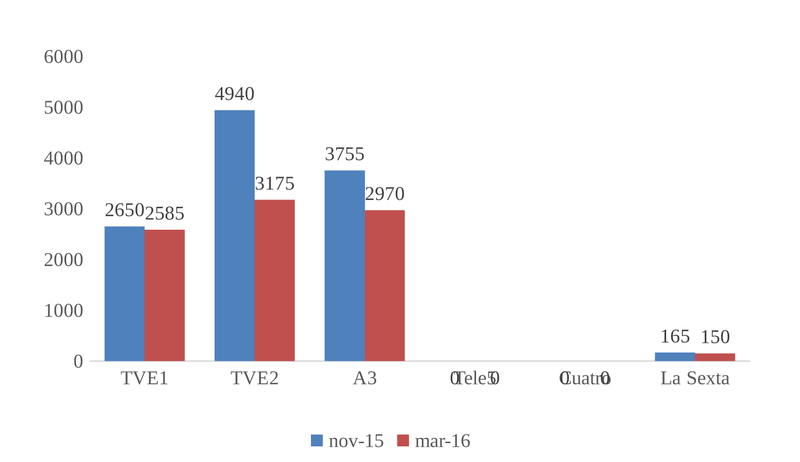 Considering time slots and the number of viewers, Antena 3 is the one that has the highest percentage with just two of its diary programmes, excluding weekend programming: 1.4 millions of viewers, 4 days a week, 3 hours a day. That does not include isolated sections in news programmes and films: in the week of 1st-7th May a fiction film set in an alternative Second World War was broadcast: Inglorious Basterds (Quentin Tarantino, 2009). This channel, that claims to be family-oriented, soft-entertainment driven, seems to consider history an asset but its real interest lies in the concept of the past. This is reflected in the way the past is used to provide El secreto de Puenteviejo with a certain cultural atmosphere. It is set in a time that is immediately prior to the time of youth of the grandparents of today: the time of the fourth generation before that of the viewers, who are mainly adults and elders. It is, as it has been mentioned before, an indeterminate time before the Second Republic of Spain (1931). The cultural level of the target audience is not very demanding in terms of historical accuracy. The feeling of past times created by the actors’ outfit and the fake old-fashioned jargon they use (archaic and pedantic enough to sound odd in the present, but easy enough to be understandable) does the trick. These factors are less obvious in Amar es para siempre. The chronological setting (Madrid in the 1960’s) is more evocative for the viewers than a mere remote and exotic background. The target audience has lived that time so the setting requires more accuracy, as it is reflected in the costumes. Nearly every scene is shot in studio, making production easier. The topics and circumstances are dealt with more visual accuracy than the previous case, although its format is still a popular one: soap opera. Nothing is more relevant than the twisted love and crime stories that constitute its plot. The setting is less important, even though it is adapted to adjust to the viewers’ memory, as memories, anyway, tend to be influenced by audiovisual products. Although it belongs to the same media group as Antena 3 (A3 Media), La Sexta has a totally different approach. Firstly, the general tone of its programme schedule is defined as bold, youth-driven and left-winged. These characteristics are reflected in the young-looking protagonists of its programmes. Regarding its political ideology, its news bulletins can be set between the left side of the PSOE and the new leftist groups derived from social movements (Podemos, Mareas, etc.). Its bold nature is reflected on the use of innovative television formats or a more direct approach than that of the more traditional channels. Were it the case, history should have been presented in a more original way, or with a new ‘re-telling’ of history. But hardly any of this could be seen on the screen. About originality: 15 seconds of comparison between Le Pen and Louis XIV. Regarding that new retelling: two minutes on the importance of comedy in history (in a transgressive humorous news programme, El Intermedio) and some minutes within a 10-minute report on the risks of progress embodied in the real-estate and industrial harassment suffered by the traditional inhabitants of the marshlands in Doñana (an Andalusian natural reserve) in Salvados (a weekly report programme). Any other use of history in this modern channel is made for surreptitious advertising: the programme Hoteles con encanto focused during the analysed week on four hotels located in historical century-old buildings. The other main private free Spanish Group is Mediaset. It has two general-interest channels: Tele 5 and Cuatro. The first defines itself as the most popular entertainment channel. It targets a general audience, with no focus on minorities that may be considered relevant due to their economical or cultural status. Cuatro, on the other hand, follows the steps of the prior cultural television project of the media group PRISA: Canal+. It rendered an impossible unrealistic ambition when it was taken over by Mediaset. The virtually total lack of historical information in Tele 5 is a logical and coherent consequence that is definitely supported by evidence: some second-long clips to introduce piece of news or to justify the commemoration of an event: 1st of May, 2nd of May (a festivity in Madrid) or the commemoration of the liberation of Mathausen. That is all: history as a supplementary documentation for the present, for a current day piece of news: the commemoration of the event instead of the event itself. Cuatro introduces history in its most successful programmes: those oriented to minorities. In one of them, history is present just as simple fragment of cultural or explanatory information to provide context for adventure trips. A professional adventurer helps some celebrity to overcome a natural challenge: mountaineering, rafting, canyoning, etc. In the thrill of the trip there is always some historical reference to add some cultural and educated touch to a nice and reasonably challenging trip with some relevant figure from the world of show-business, sport or even culture. A nice entertainment in open fields with good views of the landscape that may persuade the viewers to visit them if they have the chance. History is a mere (secondary) ingredient for the resulting product. History capsules are also present in another programme with relevant audience rates for the channel: Cuarto Milenio. An eerie atmosphere is key to this magazine that offers a succession of ghosts, spirits, tombs, pyramids and all sorts of abandoned shrines and temples of any religion given. History here is a reflection of a dark past with the only advantage of applying to any century: to the unknown of any age. This programme thrills and intrigues but does not solve any problem: not even the historical ones. History is here a necessary setting that evokes remoteness and insufficient information. All matters approached are usually left without an answer and that is exactly what the programme intends. Unintendedly, history becomes a necessary evil in Cuarto Milenio. The worst part is that historians do not take part to solve the really relevant issues (the ones the programme focuses on). The national public media group consists of TVE1 and La 2. The first is in constant competition with Antena 3 and Tele 5 for the dominion over the share, despite the fact it has not achieved that purpose for more than a decade. It does not prevent it, though, from having some leading programmes in certain time slots and days. One of these privileged products is precisely a historical programme in terms of content: Cuéntame cómo pasó. It is a weekly fiction drama series that originally set its narrative approach on the point of view of whom was a child at the beginning of the programme, in 2001. That gave the narrator’s view a tender tone that was progressively lost while he was growing up. It is the historical programme that attracts the highest number of viewers in Spain: an average of around 3.5 million viewers in the last season (2017). Its deep influence on the adult perception of the most recent past cannot be overseen: those adults have seen how their own memories could be, in most cases, identified with those images present (and, more importantly, selected) on the screen. It is not so obvious how its narrative logic works to explain the history of Spain from 1968 to the 1980’s but it is undeniable that the majority of viewers will not stop to separate one from the other. It is, furthermore, a series that can be considered ‘soft’ in terms of adequacy for a family audience in prime time. It does not only collect and display the memories of the generations that take the main role in the events narrated but it is also a reconstruction of what happened, of a past time, for the younger generations, as confirmed by those who were their protagonists: their parents and grandparents. This ‘realistic’ nature in Cuéntame is supported by the programme that begins immediately after in the same channel: Ochéntame. It is a documentary series with footage taken to a great extent from the registry of TVE. Even if Cuéntame is broadcast all over prime time and Ochéntame begins well into late night (starting at midnight, it is still considered late prime time in Spain), its audience is made up of an average number of 850,000 viewers: by far the most watched documentary in Spain (whether historical or not). TVE1 can be considered as the channel with the best quality historical contents because it offers the best formats, both in fiction and documentaries. The audience’s response is very positive: this programme is usually the most watched in that day’s prime time (Thursdays), even when it competes with other important entertainment offers: a high-budget reality show with celebrities (Supervivientes) in Tele 5, a good Hollywood film in Antena 3 and, to a lesser extent, an American crime series in Cuatro, a historical documentary in La 2 (Historia del cine) and a report in La Sexta. Being this the context, the conclusion may be that Spanish people are interested in history or, at least, 3.5 million of them are. The next question should be to what extent history is interesting for them and which type of history. La 2 is the other national public channel. It can be considered as the closest equivalent to the PBS in Spain. It broadcasts plenty of documentaries, educational, cultural and music programmes, etc. Throughout the analyzed week, 15 documentary films with an approximate length of one hour were broadcast. The main reason to worry is the fact that the average audience to switch on this channel is a 2.5% of share. It broadcast long hours of historical content in a classical audiovisual format (documentary film) but with a shortage of audience. First conclusion to be reached is that national free television channels are the ones that most meet the demand for history. Besides, their productions meet high quality standards or, at least, that is the case in the weekly historical fiction series Cuéntame. This programme does not only usually reach the general audience peak for its time slot (and, what is more, happens to be prime time) but also draws more than one fifth of its viewers to the following programme (a historical documentary series that deals with the same historical period of the previous series). The stunning result is that the highest audience rate in the late prime time slot in Spain is achieved by a historical documentary. The second conclusion is that fiction is a favourite mean to approach history or, at least, to the past. Good audience rates are also achieved in the early evening slot (4:30 p.m. to 6:00 p.m.) with soap operas set in the past. The target audience in this case is, in general terms and from a social and economical perspective, not an elite group in comparison with the prime time slot. Setting the action in the past, nonetheless, makes it more culturally attractive to those people, who would prefer it over the gossip programme that constitute the main competitor at that time. Those who are not interested in celebrities’ lives and scandals, in their fights, their social lives, their marriages and divorces, their new couples, etc., find a less tasteless alternative in past-set series. At least they are safe there from all the yelling, faked offenses, reconciliations, parties, fashionable outfits, etc. In that context, as it has been previously explained, a historical setting is a remarkable cultural asset. The most watched historical material is the one broadcast by means of the most popular television format, in which history fits best the narrative: a weekly or diary fiction series (soap opera). History is there an ingredient to produce entertainment. In other words: viewers are willing to watch historical content, as long as it does not spoil their fun in front of the TV set. Those really interested in learning about history are more likely to opt for a book rather than the television session their friends may prefer. Documentary films and series have their share of time on screen. It is also still believed to be the ideal format to properly deliver historical content. Leaving aside for the moment this theoretical and practical matter, it is worth mentioning that the most watched documentary series is such because of its connection with a related fiction series. The other documentaries have barely any audience, even though the total number of viewers for each of them is typically above the 100.000 mark. They are, therefore, a positive mean to explain history but they do not reach the popularity of fiction and channels’ competence to gain sponsors have drawn them out of the main programming slots. One channel has bet for an evening offer of fiction series set in the past (one in a remote past, the other in a recent past). This strategy prevents competition with other more expensive and competitive programmes and has enable the channel to attract an interest group who is not appealed by tasteless gossiping. In other words: there is a place for history in fiction television. The value and accuracy of the history represented in those programmes and formats is a different matter. The fact that only the national public channels try to offer quality historical contents is a clear evidence of the difficulty history has to find room in a world of pictures where channels compete fiercely to gather viewers to watch ads. These limitations are essential because, if in the world portrayed on television history plays no relevant explanatory role, only two outcomes may result. First, a logic of normal (an everyday routine) that will be essencialist: out of time. The other, an understanding of life progression as a chain of emotions and feelings that will find a replica in the viewers’ lives. People without a past, abandoned in a market in goods and services with a publicity convincing enough to be seen as an affordable paradise reached through consumerism.